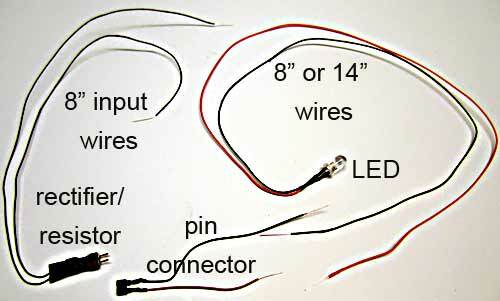 Fitting the LED into a narrow brass tube or inside of a model can necessitate a special setup. These LEDs are separated. So you can fish the LED in from the top and not have to worry about the rectifier/resistor fitting in. Then, when you have the LED placed, attach the rectifier/resistor to it. Then apply your 7-19 volt AC/DC/DCC power. Also great for track side vehicles, the rectifier can now be under the bench instead of inside the car.